Deviation #1: There’s no POV character in either setting. The Problem: In shows such as these, there’s almost always someone who’s just starting his or her first day on the job, allowing us to get the know the staff and their mission. Deviation #2: The pilot script couldn’t attract strong actors except the leads. Does the Show Get Away With It? No. This was another reason there always had to be a mole in CTU: Jack had to get out of there because the storylines there were never lively enough. 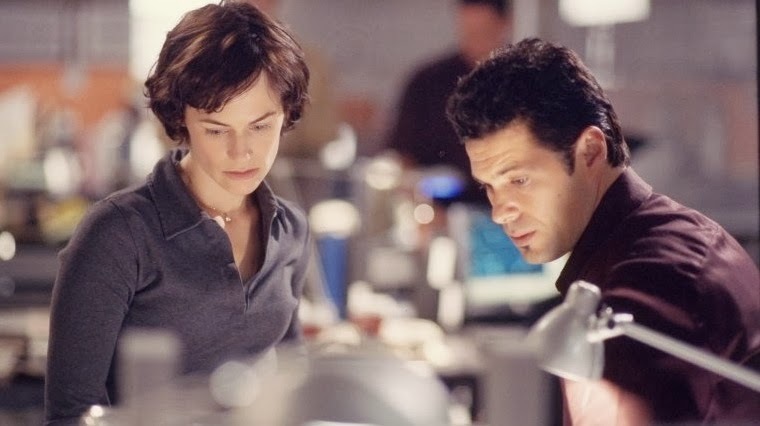 This wouldn’t change until the third season, with the introduction of Chloe, the abrasive computer tech played by Mary Lynn Rajskub, one of a long line of TV guest stars who stuck around and gradually rose to co-starring status, as well she should. Do you think 24 gets away with having such a weak bench of players because it's so actiony? That it really is more like one massive drawn-out action film per season with a lone hero than it is like a more traditional television thriller, which would be built around some kind of "family"? Or is all of this at least partially the fault of the show's worldview of extremist individualism, which leaves little choice but to make the other characters cardboard cartoons. On to the importance of tech-nerds, who will explain stuff to the audience in the guise of explaining it to the tech-impaired hero. > Do you think 24 gets away with having such a weak bench of players because it's so actiony? Yes, but that's no excuse. HOMELAND has a lot of thrilling action with much stronger characters.